Today, July 18, Nelson Mandela turns 93. And by all accounts he's enjoying the day in the best way possible - surrounded by family.Congratulations!! As it turns out, I just finished reading the most interesting book about Mr. Mandela (especially for a foodie/history geek like me), "Hunger for Freedom: The Story of Food in the Life of Nelson Mandela". The author traces Nelson Mandela's journey in food memories and recipes from the corn grinding stone of his Mvezo birthplace and simple dishes of his youth, through wedding cakes, prison hunger strikes and presidential banquets, and on into a retirement with the Mozambican seafood dishes of his third wife, Graça Machel. While I won't be making seafood dishes from Mozambique any time soon, I DID gain an entirely new insights on the personal and political events in Nelson Mandela's life. And yes, I found some recipes I want to try (or already have!). Read this book if you have the opportunity. 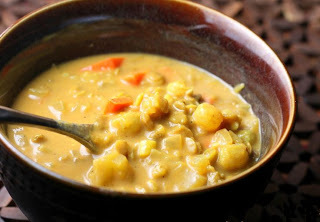 Since I don't have the publishers permission to post an exact recipe here - and since most of them require a great deal of "vegan-izing", I am instead posting a vegan variation using the same ingredients, techniques and spices - but without the soup bone, butter and other animal products - still delicious (probably more so in my opinion!). As with apple pie, goulash, borscht or other "classic" national recipes, there are hundreds of personal variations; this is just one version of the South African classic soup or stew "Potjiekos" (roughly translated as "Pot Food") and it is SOOO good! In a heavy-based soup pot, sauté artichokes, potatoes, onions, leek, zucchini, carrot, garlic and ginger with margarine and spices for five minutes or until vegetables just start to turn color and cook a tiny bit. Cover with liquids and simmer for 20 minutes or more until very soft - watch and add more water if needed. Remove cinnamon stick, then blend in a food processor until creamy (or leave it somewhat chunky - I did this the second time and actually liked the end result better). Thanks for the book tip! I love reading books that are stories (and are good) that also have recipes in them! One of my favorites is http://www.amazon.com/Embarrassment-Mangoes-Caribbean-Interlude/dp/0767914279/ref=sr_1_1?ie=UTF8&qid=1311193871&sr=8-1 you should check it out! This soup is just what I'm looking for. A contestant on Top Chef made some kind of vegetarian African peanut stew that reminds me of this. Mmmm.